Esri's Community Maps Program Announces Community Addresses! The ArcGIS World Geocoding Service helps you find and display global addresses on a map with a high degree of accuracy. Its global address dataset includes data from commercial sources, all levels of government, and many reputable mapping organizations. Esri works with its global distributors to include local data suited for each region for an unrivaled user experience. International reference data ensures that ArcGIS World Geocoding Service offers consistent and authoritative geocoding results. Our Community Maps contributors have been asking how they can help improve Esri’s World Geocoding Service. Many of our contributors are managing progressive communities, where new residential and commercial areas have been constructed. Some are enhancing their city or county 911 system that uses ArcGIS mapping as an essential component. The Community Maps Program uses best available address datasets to support ArcGIS World Geocoding Service. Included addresses represent comprehensive and accurate locations for many countries, and are available to search against and provide the most accurate geocoding results. You can now contribute point and polygon address data to enhance the geocoding experience of your users. How do I share my Community Addresses? Easy! Click on the image below to download the latest version of the Community Maps Data Prep Tools, we have included a new tool that prepares address data! There are instructions to help you along the way. Just email the Community Maps Team (communitymaps@esri.com) if you have questions. 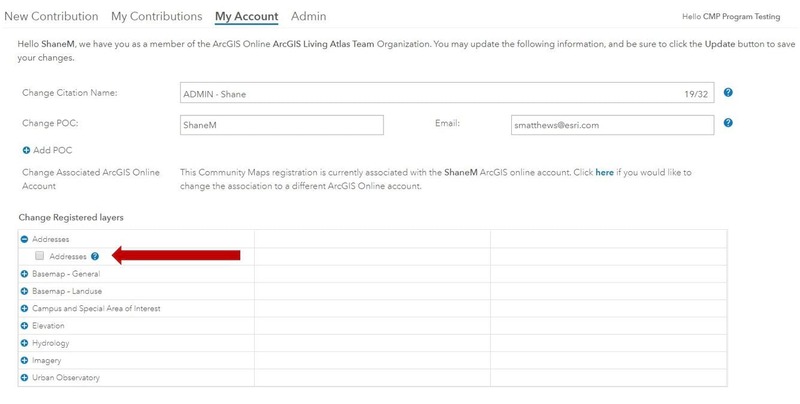 If you are a registered Community Maps Program contributor just log into your account, select ‘My Account’ and select Addresses under the ‘Change Registered Layers’ section. Not registered with the Community Maps Program? Get it done here! It’s back to school with a Community Maps Data Prep Tools Update!